I just wanted to let that hang there for a second. 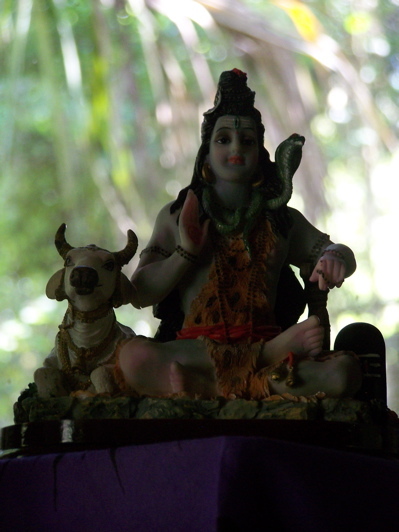 In my grasping to understand the complexities of Hinduism, I have been very aware that my pain is obviously in coping with the material world–and I’m not coping all too well, I might add. There is trouble in having expectations of any kind placed in the mechanics of the material world; then of developing attachments to (among other things) your expectations; and finally of not letting go of said attachments. Expectations, it seems, no matter what all bothers are bound up in them, are always the source of my pain. When I expect to sell a lot of books and I don’t, the pain of that dashed expectation stays in me, like a fragment of the Devil’s Mirror from Hans Andersen’s “Snow Queen.” I have dozens of those little fragments in me, say for another example an expectation that if I practiced a lot and got good, people would want to hear my music, or expectations that I was more important to someone than I really was, then there are the expectations that that are not so large that are dashed, ones that simply dissolve. I can not handle failed expectations. Similarly frustration, but doesn’t frustration spring from hope or expectation? So in my life, my inability to let go of misplaced or dashed expectations goes cold and bitter. And this rests in my belly like black bile, so I do all I can to try and avoid having expectations. Of course, as graphic as I’ve made all this sound, it’s hardly an original realization, it lies at the core of the teaching of Hinduism and Buddhism, that of letting go of attachments. Of course if I have heard this teaching once, I’ve heard it a thousand times… yet why why was I so afraid of letting go of attachments, and why did I not understand, let alone GET, the teaching until recently? Expectations are certainly one of the ways obstacles and attachments manifest themselves. My rather poor way of dealing with it seems to be to try and create a life in which I have no expectations, I simply do or do not do things without expectations that they will pay off. Good luck, Justine… you just don’t have that in you. The only way I seem to know how to cope is to avoid situations that will result in my having expectations. This was essentially why I had sworn off drawing (after the collapse of my indie comic) for over two years before I was struck with cancer while living in South Korea and felt suddenly compelled to sketch obsessively well before I had been diagnosed. My stagefright as a musician spoils my talents, weakens me on stage to the point of heartbreak, which is of course a dashing of the expectation that all my practice would pay off and I would perform to my full potential. And beyond that, there was of course the dreamy and admittedly misplaced expectations I had developed around my music and the notion that I would be able to score a few low-paying gigs or get a little indie record company to take me on. Though my expectations were low… they were not met in the least, and eventually I became frustrated and lost the desire to play. Of course, that only lasted for a while, and I am back at it now. Perhaps it’s not so extreme after all. It seems what I need is time. I need time to let go, to eliminate my expectations, then to carry on. The smaller dashed expectations dissolve rather quickly before I can carry on carrying on. The trouble is, this process takes a long time when there are big expectations and life plans that are dashed. Sadly, in that time, there is a bitterness inside that seems to taint almost everything. it is difficult not to make mistakes, misread a person or situation, or be at peace if you are carrying around such an attachment to expectations and the scarring of failed expectations. Through meditation work I have been doing lately, much of it hard, even painful, I understand very clearly now, what they all mean about letting go of attachments. What I am hoping to get from my spirituality at the moment is a way of letting go of attachments before they turn cold and bitter. I would like to let go of more things much faster. More importantly, I want to learn not to have those expectations at all, but to continue what I am doing even if I am involved in an activity where once there were expectations that had not come to fruition. My friends, that is a lot to be letting go of. That is the work I am doing before Lord Shiva now. I am asking him to do the work, that to the best of my knowledge, he is meant to do. Funny, before Shiva came to me, I had no clue where to even begin on all of this. Inspiring and very welcome to me today!